Falcon and Associates is a strategic advisory company working on behalf of Dubai’s leadership. This project saw Capsule Arts work closely with interior designer firm, AK Design, for Falcon and Associates’ new office extension in DIFC Gate Village. 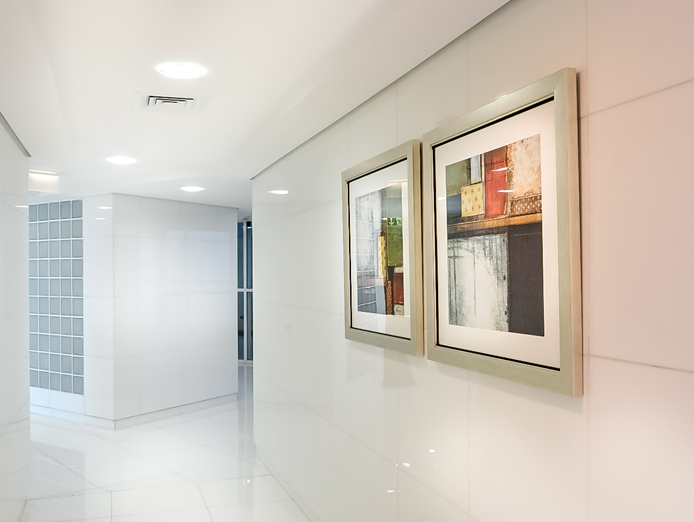 The aim of the office refurbishment and accompanying art package was to communicate the company's brand and vision, as well as enlivening the office space for employees. 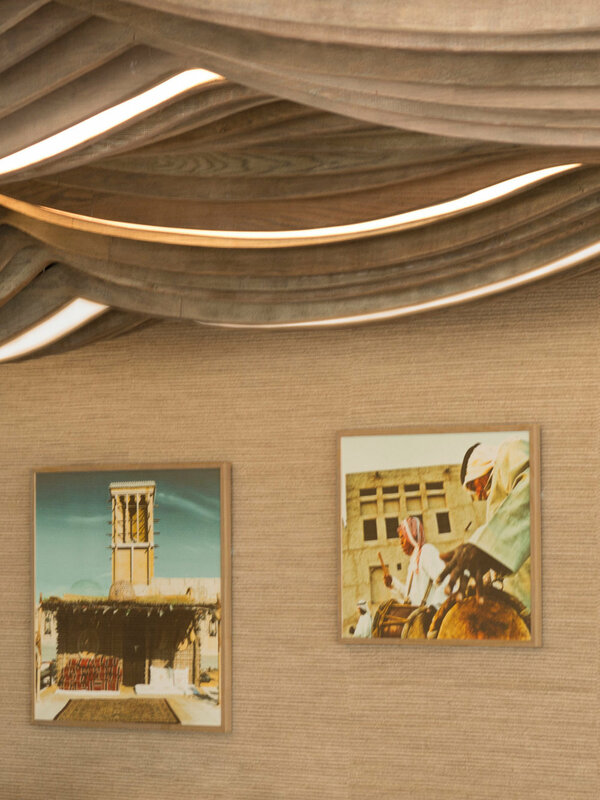 Both the interiors, and the artworks that Capsule Arts developed, were heavily inspired by the culture and heritage of the Emirates, along with the company’s iconic falcon logo. 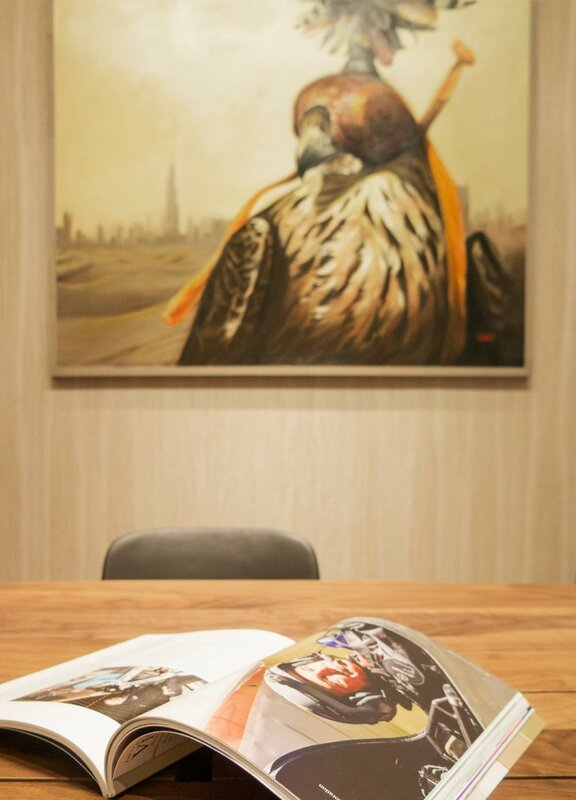 A number of original oil paintings were commissioned for the project – a series of sepia tone sheikh portraits by Stephen Chambers, along with a painting of a hooded falcon by artist Matthew Ryder, who is well-known for his powerful animal portraiture. The falcon was again referenced in a roughly hewn stone-finish sculpture by Dubai-based sculptor, Anneke Bester. 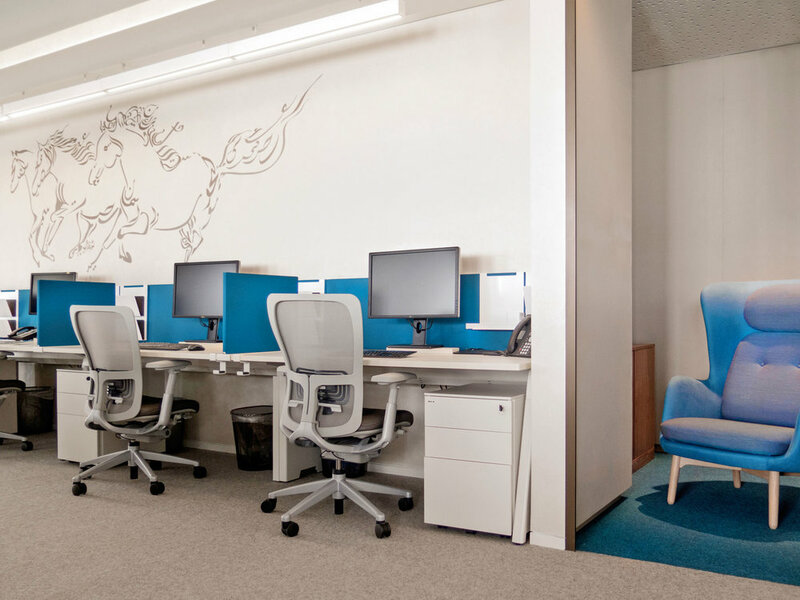 Throughout the open plan workspaces, a series of dynamic wall-based vinyl artworks were created by artist Lama Khatib-Daniel, showing a series of galloping horses formed from sinuous Arabic calligraphy. 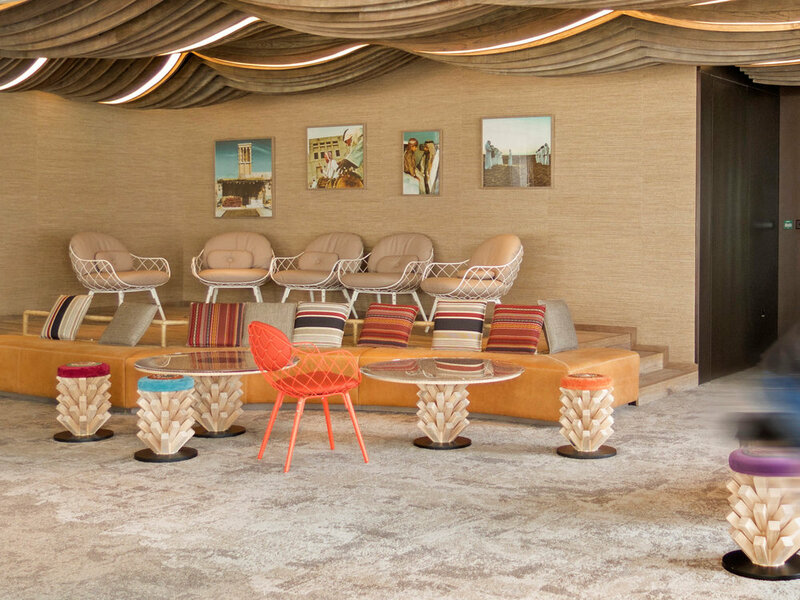 For the lounge area, Capsule Arts worked with Falcon and Associates’ own collection of fascinating historical photography of Dubai and Sheikh Mohammed to create a series of framed photographs, which were edited to give a vintage-style colour tint effect. To encourage staff to use the stairs connecting the original office on the floor above and the new extension, Dubai artist collective Brownmonkeys created two large-scale painted murals in the staircase which continued the theme of the culture of the Emirates, with a focus on the UAE’s native wildlife. 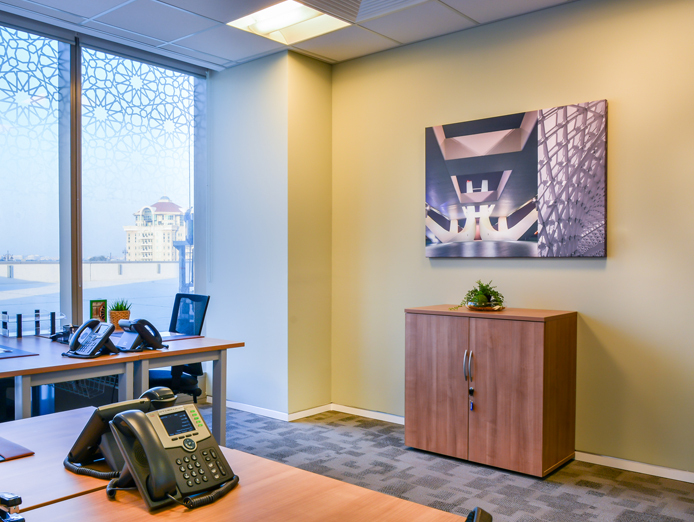 Along with the artworks, Capsule Arts also created a series of custom-made woven lights for the informal meeting rooms, which were inspired by the traditional weaving techniques still used in the UAE today. A number of UAE-based artists were commissioned for the project, as it was important to the company that they were engaging with the local artist community. Artists featured in the project include Matthew Ryder and Lama Khatib Daniel, who are both part of Capsule Arts’ limited edition art print collection; along with Brownmonkeys, Stephen Chambers and Anneke Bester – all of whom live and work in Dubai.